From left, Andrew Canon, director of the Hidalgo County Metropolitan Planning Organization; Raul Sesin, general manager of Hidalgo County Drainage District No. 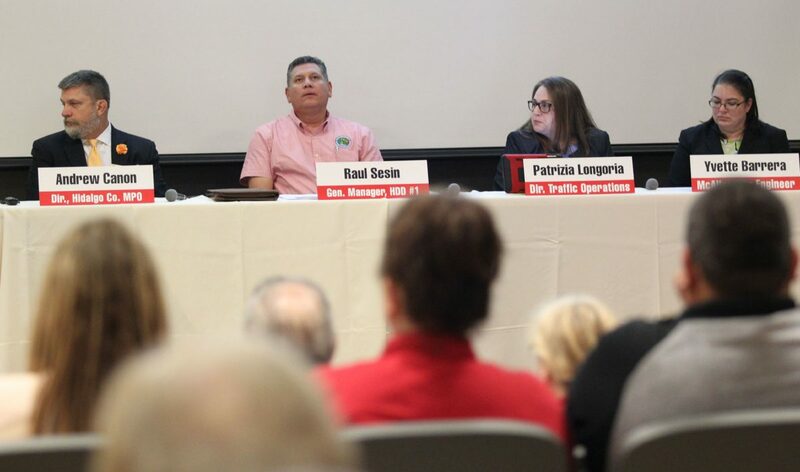 1; Patrizia Longoria, director of Traffic Operations; and Yvette Barrera, McAllen engineer, during a McAllen Bond Election Forum at McAllen Library Wednesday, April 11, 2018, in McAllen. McALLEN — The city began its blitz of public events Tuesday informing residents about the two-proposition bond election in May, presenting what the city plans to do with the $25 million, if voters approve both measures. City staff presented information for the two propositions — one being $22 million toward drainage improvements, the other $3 million for traffic improvements — on Tuesday at Town Lake at Firemen’s Park to roughly 10 residents on hand. They explained the $49 million storm drainage master plan, past drainage projects and traffic congestion issues. City Commissioner Veronica Whitacre met with residents after the meeting. Tuesday’s event was followed by a Futuro RGV event at the McAllen Public Library on Wednesday that, in cooperation with officials from across the county, explained drainage and traffic issues in the city and county. The city will hold additional town hall meetings at 5:30 p.m. on April 16 at the Palm View Community Center, April 17 at the McAllen Public Library, April 18 at Lark Community Center and April 26 at the Tres Lagos Community Center. Early voting for the May 5 election begins April 23 and runs through May 1. Residents’ questions on both Tuesday and Wednesday revolved around flooding concerns and increasing traffic flow. Dee Treviño, a McAllen resident, said after Tuesday’s town hall that she knew the bond election was coming, but didn’t know everything the two propositions entailed. If the drainage proposition passes, it would, on average, cost each McAllen taxpayer about $21 per year, while the traffic measure would cost approximately $3 per year. So far, attendance has been low with the best turnout at the Futuro of roughly 30 people, some of whom were not McAllen residents. But Mayor Jim Darling said after Monday’s city commission meeting that turnout is typically low for bond elections, so putting as much information out there as possible is necessary, he said. Treviño, who didn’t know what to expect going into the meeting, came away encouraged. Would she vote for both propositions?